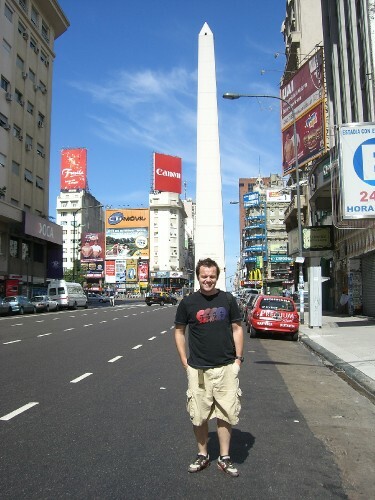 Blog from Buenos Aires, Argentina | Where is the Love? This is a little bit of a back dated blog entry written on 10th of January in Christchurch, New Zealand for our visit to Buenos Aires in the middle of December. Time has flown over the festive period, and there is not much incentive to enter the internet cafe when you have an ice cold beer in hand on the beach in 30C heat. Nice way to spend New Year. Buenos Aires was a fantastic city and easily our favorite in South America.It had a very European feel to it and the infrastructure was much more developed than any of the other South American cities we had visited.We stayed at a central hostel very close to the Oblesico.The hostel was great, clean, central and best of all cheap. Most of our three days here was spent walking around the vast city which is made up of several different and contrasting neighborhoods or Barios.Amongst other things we visited Florida St, the main square, Eva Peron's tomb and Bocca including the famous Bocca Juniors football ground but unfortunately it was out of season so we could not see a game. By far the highlight of the visit was Tango Show Michelangelo.We were treated to Champagne reception, 3 course meal (including the biggest steak the world has ever seen which you will be surprised to hear I finished easily), as much wine as you could drink and the Tango show itself for the price of our ticket.The food and show were amazing and we had a great night.The only problem was that Hannah felt the waiters were not topping up the white wine fast enough.A statement she soon retracted the next morning. From Buenos Aires we got a taxi out to the Airport. Despite the European feel taxis still don't have seat belts or acknowledge speed limits or indeed other traffic.From here we are flying to Santiago but are really looking forward to getting to New York.